These two drafts are both for 15 shafts and they both employ a 3-end (jeans) twill as their structure. The first draft is based on a block profile for 5 blocks. 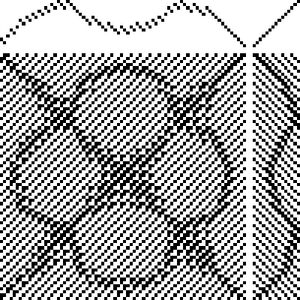 The second draft follows the same basic shapes, but the lines are smoothed out in this networked version. The network is based on a 3-end initial. The networked version is curvier, but the edges are less clear-cut; the fuzziness is characteristic of network drafting. These drafts are both from my files and were probably done before 1994. They were candidates for Network Drafting: an Introduction (see sidebar), but never made the cut. They'd be great for monochromatic apparel fabric in fine cotton or silk. From my design files (while I'm waiting for a loom replacement part, due to arrive today), some photos from my trip to Charleston. First the beach at Sullivan's Island, then a turtle at the South Carolina Aquarium, then a low-hanging branch near the Ashley River at Middleton Place, and finally the sky, as seen from the car window on the ride home, just before a cloudburst (and no, I was not the driver). 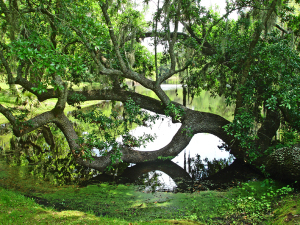 I am just back from a trip to Charleston, SC, for the Sheep and Wool Days at Middleton Place. The demonstration of sheep dog herding was especially fascinating. Those dogs are way smarter than some humans I'm acquainted with. And there were spinning and weaving demos, dyeing, vendors, and lamb kabobs. 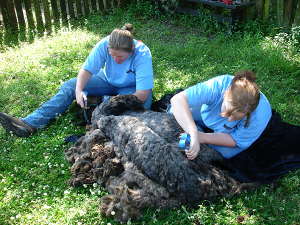 Here are two sheep shearers at work. I promise you there is a sheep someplace under all that wool. We also walked through some of the extensive gardens at Middleton, and although the fabulous azalea display is mostly finished, there were other wonderful sights. 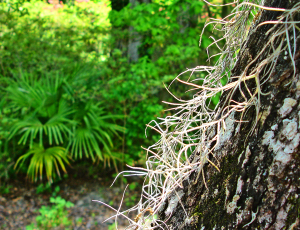 Here is some Spanish Moss. No, I don't think it makes good weaving material, but I know lots of people have tried. At last the threading of the heddles is done, and I have just completed the sleying of the reed (That represents another large chunk of Felix Holt on my iPod). Notice the moiré effect on the reed. 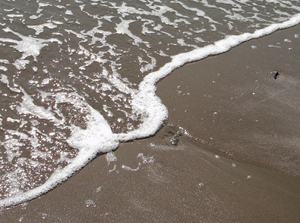 I know people have written reams on how to get rid of that effect in their pictures, but I love it when it occurs. It's like a secret message from the great Weaver Spirit of the universe. While I was photographing the reed, I also took the opportunity to photograph the tool rack tied to the inner right side of the top beam of my loom. 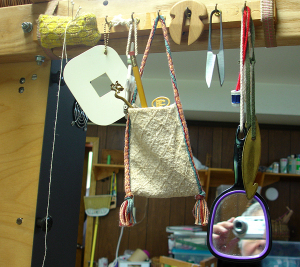 7. a knitting row counter, a reed hook, and a mirror for occasionally inspecting the underside of the cloth (That's my nose in the mirror. And there are actually three reed hooks in this picture. Extra points if you spot them all). Although there is no shortage of knitting-related content on the web (and yes, I have joined Ravelry) I’d like to add my two cents today. First, here’s a scan of my alpaca sweater at approximately 12x lifesize (click to enlarge to full size). And now that the scene is set, I’d like to tell you about one of my favorite short films. Adults love Wallace and Gromit as much as children do. Read all about them here. A Close Shave, an animated Wallace and Gromit claymation tale by the enormously talented Nick Park, is a film I’ve watched at least a dozen times in the company of my grandchildren. 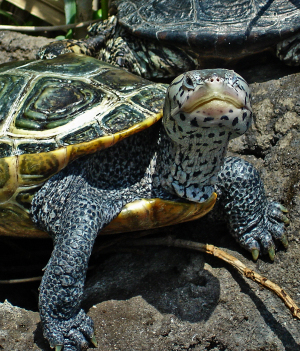 It has great fiber content! Do yourself a favor and rent/buy/borrow this film and become a fan, as I am, of Wendolene’s Wools and Wallace’s Knit-0-matic. Enjoy the artistry of Park’s rendering of knitted fabric in the unlikely medium of clay. Cracking good! Yesterday Neki suggested some additional web resources for automatically generating palettes. 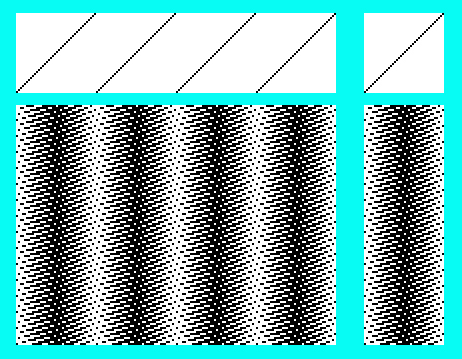 The one from Big Huge Labs appears to be the most interesting - at least it generates a bigger palette, 15 colors. 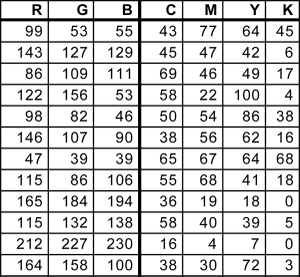 All the programs produce the hexadecimal values, which are easily translated into RGB or CMYK in Photoshop, or in other programs. Big Huge Labs even names the colors, with names like "cherrywood," "horses neck," and "jambalaya." 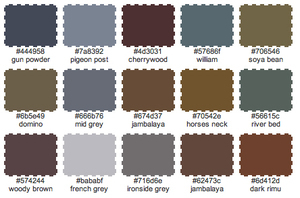 Here's a screen shot of the palette generated from the photo in the April 21 post. None of the programs picked the colors I really like in the original scene, so I think there is still some room for the human artist here :-) For instance, I am missing the purplish reds and the acid greens in the web-generated palettes. When I pull a palette from a photo, first I convert it to an indexed mode and force it to approximately 24 colors, then from these 24 I pick my favorites by option-clicking on the desired pixel with the pencil tool (zoomed way in, here) then drawing a dot on a swatch. What more can I say? This threading goes on forever. At least it's a straight draw, and I don't have to concentrate especially hard. The good news is that this is an opportunity for an Audiobook. Currently I'm listening to Felix Holt by George Eliot. I adore George Eliot, and the reader for this particular recording is one of my favorites, Nadia May. Coincidentally, Felix Holt is an apt choice for an election year. The action takes place in a fictional English town during the election of 1832. 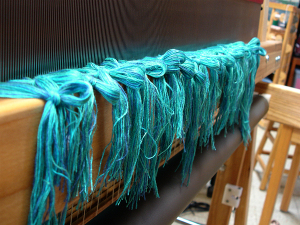 For the past few days I've been beaming a new warp on the sectional beam of my dobby loom. 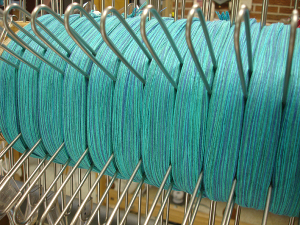 Four ends at a time are being wound on my warping reel, all shades of blue; two yarns are bamboo, one is rayon, and one cotton. They will be chosen randomly within each group of four as they are threaded in the heddles. Threading begins today. Thanks for all the wonderful responses to my post about dyeing to match a Photoshop color palette. I was happy to learn about the Dye Mixer applet. It was interesting to see the complete "spectrum" (pardon the pun) of opinions re the doability of dyeing to match a specific palette, all the way from yes, it's doable, to no, it's not worth the effort and the time would be better spent ordering pre-dyed yarns to conform to a palette. 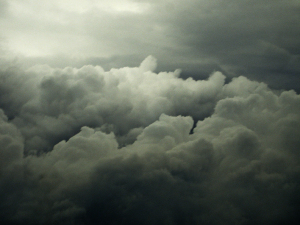 We all have different working styles and time constraints, and I guess the bottom line is do what feels right to you. My particular style leans toward purchasing the ready-dyed yarn, but I do find the concepts of dyeing to formulae fascinating. It's fun to find new uses for old tools, and part of what I love about the marriage of weaving and the computer is that new offspring are always appearing! 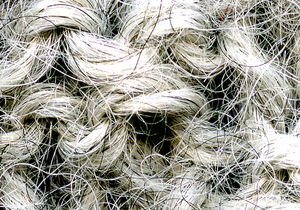 When I started weaving umpteen years ago, I never dreamed that I'd have the good fortune to work with personal computers and the great weaving software that is now available, and as for Photoshop…well, pardon me while I sit down and catch my breath. A few weeks ago, before the march of spring was very advanced, we came across the following scene at a nearby lake. 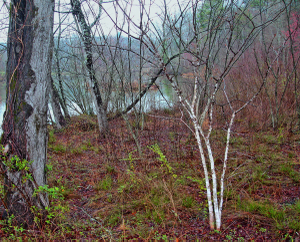 The day was overcast and the colors muted, but a closer examination revealed a beautiful palette. These are not the garish and brilliant colors of summer and fall, but the muted tones of a gentler time of year. I pulled twelve color samples from the photograph, and listed their RGB values. These can be easily translated to CMYK equivalents in the computer. I am not a dyer, but I'm wondering if the CMYK percentage values of these colors could be translated into percentages of cyan, magenta, yellow, and black dyes, and the palette reproduced in yarn. Do any of you have experience in this area? Looking at yesterday's post, I was thinking about another approach to shaded stripes. 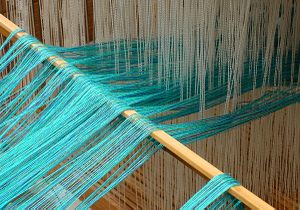 In Photoshop, start a new file whose width is equal to the number of shafts on your loom, and whose length is a multiple of the weave structure, in this case an 8-end satin. My example is 40x120 pixels. 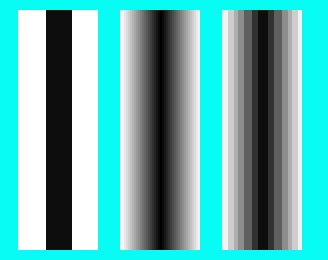 Draw a black stripe on a white background, and blur this image. Index the file to 7 colors, break each color out into its own layer, and assign the seven inclusive steps of 8-end satin to the layers, one at a time. Flatten the file, copy it to your weaving program as a liftplan, and team it up with a straight threading.